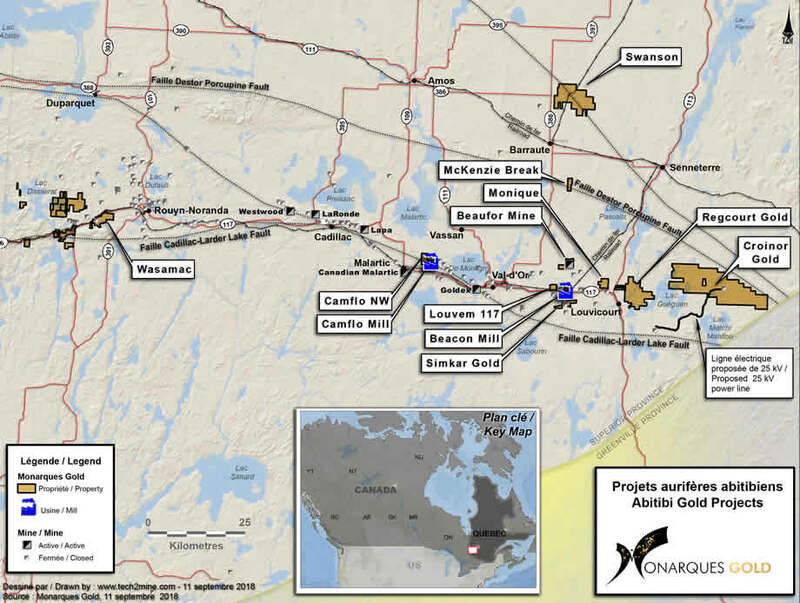 Monarch Gold holds a 100% interest in the Simkar Gold property, located 20 km east of Val-d’Or, in the heart of the Abitibi Greenstone Belt. The property comprises two mining concessions and 15 claims covering an area of 5 km², and is subject to a 1.5% NSR. The Simkar Gold property is located in the Abitibi Greenstone Belt and includes a large sequence of Malartic Group volcanics and pyroclastics striking east-west and dipping steeply toward the south. This assemblage is intruded by quartz-feldspar porphyry dykes and sills, with which gold mineralization is spatially associated. This mineralization is Sigma/Louvicourt-type mineralization, which is the result of fracturing of the relatively competent sill-like (mainly diorite) intrusions, followed by the growth of en-echelon vein systems. Progressive deformation causes dilation, and repeated reopening results in "crack and seal" veins, often with bands of tourmaline that form with successive infillings. The veins pinch and swell, and often branch and intersect in response to localized stress fields.